With the kitchen shears, cut the face side of the crab from the body. Turn the crab over so the white side is facing up and pull up the pointed "lever" that reveals a flap and cut off the flap. Turn the crab over again so the blue shell is facing up, and lift both pointy sides of the shell to reveal the lungs. Remove them. Rinse the crab, pressing out the green "tamale" from the inside if you desire. Pat them dry and set them on a tray. In a large skillet, heat the oil. 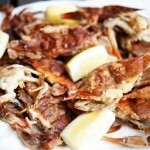 Combine the salt and flour in a shallow wide bowl and coat the crab lightly on both sides. Drop the crabs in the oil and let it sizzle and cook for 4 minutes on each side, until the shell turns red and crisp and the flour has turned golden brown. Remove to a plate covered in paper towel and sprinkle with salt. Serve with lemon wedges!